Dorsalis Pedis Artery is the main artery of the dorsum of the foot. The dorsalis pedis artery is the just the continuation of the anterior tibial artery. So it starts as the anterior tibial artery passes by the ankle joint. 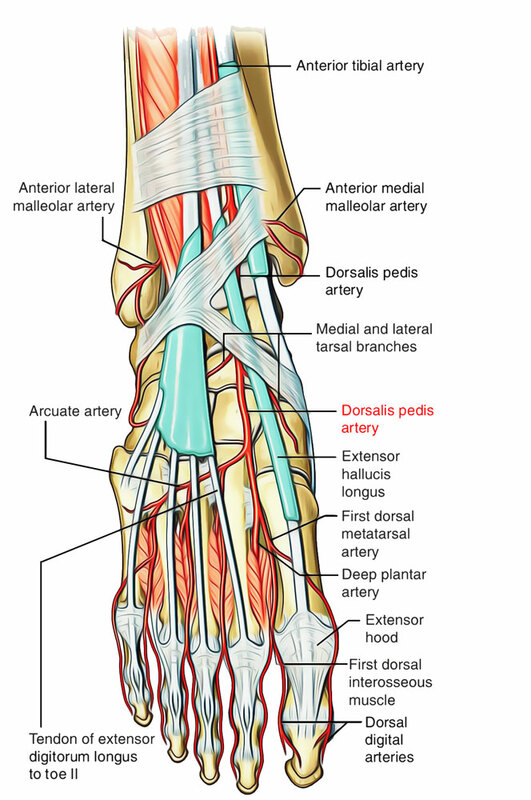 The dorsalis pedis artery is the direct continuation of the anterior tibial artery in front of the ankle. It enters forwards along the medial side of the dorsum of the foot to get to the proximal end of the first intermetatarsal space, where it slopes downward between the 2 heads of the very first dorsal interosseous muscle to goes into the sole of the foot where it stops by anastomosing with the lateral plantar artery. Superficial: Extensor hallucis brevis crosses the artery superficially from the lateral to medial side. Deep: Ankle joint and tarsal bones. Medial: Tendon of the extensor hallucis longus (EHL). Lateral: First tendon of the extensor digitorum longus (EDL). Variations of dorsalis pedis artery: (a) In about 14% of cases, it could be replaced by the perforating branch of the peroneal artery, (b) It could be too large to compensate for the small lateral plantar artery of the sole of foot. 1. & 2. Medial and lateral tarsal arteries: They take part in the formation of medial and lateral malleolar arterial networks. 3. Arcuate artery: It originates near the base of the 2nd metatarsal, and runs laterally with minimal convexity toward the toes, to get to the lateral border of the foot. It supplies 3 dorsal metatarsal arteries (2nd, third, and fourth), every of which breaks up into 2 dorsal arteries for the lateral 4 toes. The Lateral 1 sends a twig to the lateral side of the little toe. 4. First dorsal metatarsal artery: It stands just before the dorsalis pedis artery dips into the sole of the foot. It breaks up into dorsal digital arteries for the adjacent sides of the first and 2nd toes. It also provides a dorsal digital artery to the medial side of the big toe. Dorsalis pedis artery pulse: It can be easily felt between the tendons of extensor hallucis longus and first tendon of extensor digitorum longus. It’s regularly palpated in patients experiencing vaso-occlusive diseases of the lower limb, viz., Buerger’s disease. The clinicians sensing this pulse ought to know the dorsalis pedis artery is congenitally absent in about 14% of the cases. In such cases the absence of dorsalis pedis pulse ought to be affirmed by the posterior tibial artery pulse.